Today I leave San Diego for AZ to resume my Prius Vandwelling. I will be leaving by noon and will be ahead of the impending large CA storm with heavy rain and high winds. It's Friday before President's Day weekend and the granddaughters do not have school. I also signed up to be available for the company my son hired to put gutters on his house. 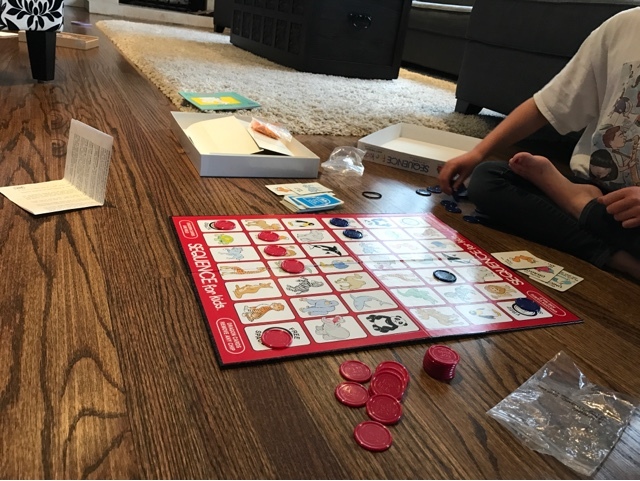 Above is one of the games I played with the granddaughters this morning before leaving. I enjoy the time with them and they enjoy the time with me, asking me to stay longer. 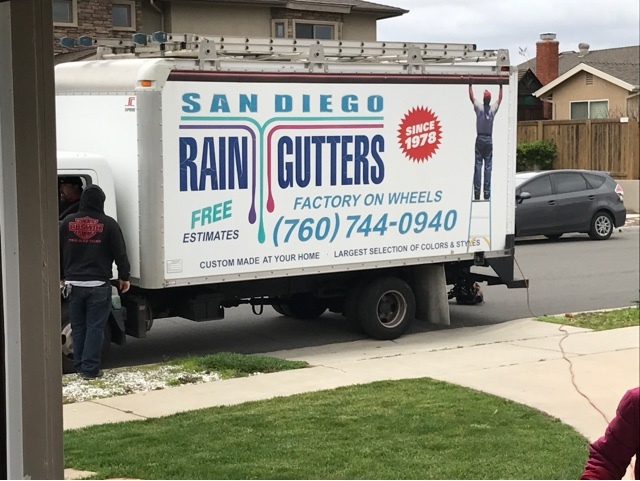 The gutter company did come a few minutes early and started work. By the time they showed up at 10:30 the wind was already gusty but no rain. As I drove away, heading to AZ, they had extruded the seamless gutter for the back of the house, but it was so long and unsupported all the way, that the wind took the end and wrapped it on itself. Distorting the gutter making it unusable. My son later texted me that the gutter company will be back to finish the back of the house. They did complete the front of the house where it was protected from the strong wind. I ran into traffic associated with construction and weather. Above is on I8 just east of Yuma, AZ. The stop and go traffic for miles had me thinking that it was construction, but it wasn't. The stalled traffic was caused by the border control station built on I8. Holiday traffic had overloaded the check station. A boarder control truck came down the side of the highway with lights on and closed the checking station to open up the miles of backed up traffic to pass just as I was approaching it. 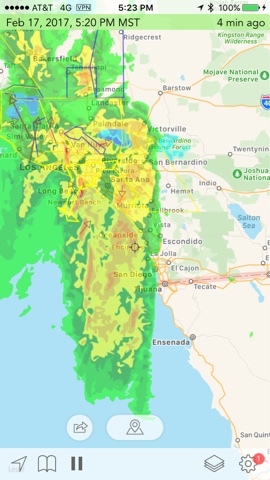 Later I checked the radar for the San Diego area and the heavy rain was just starting. It looks like I got out of San Diego just in time. Gov. 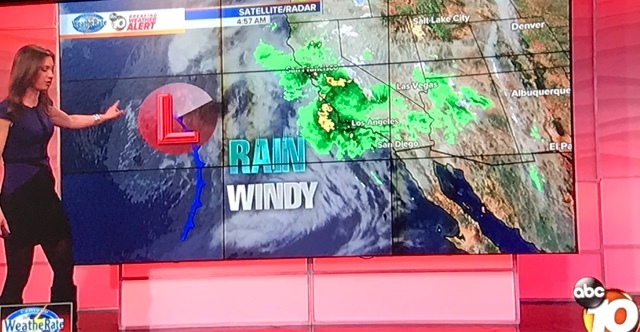 Jerry Brown has declared a State of Emergency for San Diego County and other counties across California following yet another day of dangerous winds, bands of rain, heavy snow and colder temperatures. Brown's declaration will allow the County to help secure funding for communities to respond and recover from severe winter storms. 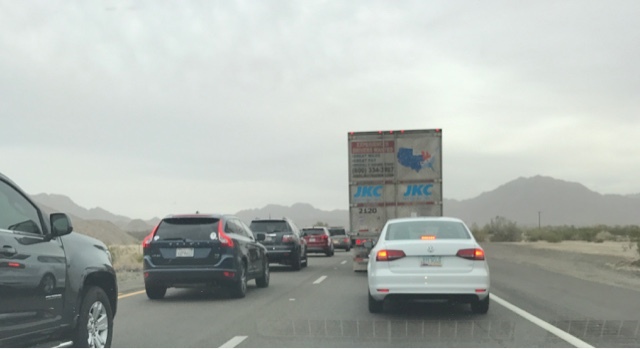 In Pine Valley, east of San Diego, California Highway Patrol (CHP) officials shut down eastbound Interstate 8 at Crestwood Avenue due to jack-knifed big rig. One lane of I-8 east of Kitchen Creek remains closed due to a rock slide. I will be heading to a location in the desert to check out my new lightweight backpacking equipment and dehydrated food that I have never used. I may be out of cell range to post every day but I will be capturing my findings and preliminary hikes with the new pack loaded to prepare for the backcountry hike in March. If you don't see a day post for a few days don't worry I'll be back.